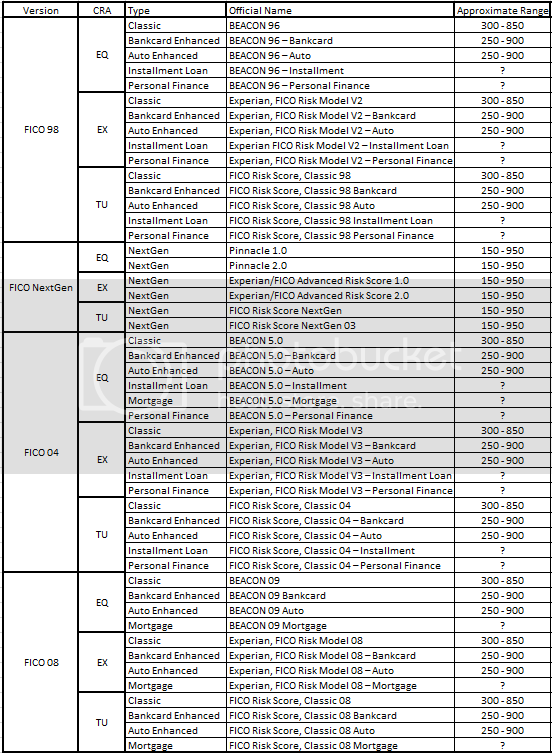 Here's a summary table of the 49 different FICO scores I made based on the information on this thread. my credit reporting ageny scores are all over the board equifax is 775 transunion is 685 experian is 601 how can that be? and what score will be used if i want to apply for a mortgage? Most likely when you have differences that extreme it's because you have very different items on each credit report. You should pull your free reports from annualcreditreport.com, see what's on them, and start correcting problems. You may have baddies on EX that aren't on your EQ report, for example, or one bureau could have put someone else's information on your report by mistake while another bureau has it correct. When you apply for a mortgage, the bank will use the middle of your three scores, so go and make sure those scores are based on accurage information. Where did you get your scores? Do you know if they're actual FICO scores? If they are actual FICOs, the reasons they are so different from one another are version specific and CB specific. If you got them from MyFICO.com then they are the following. They will pull all three FICO 04 Classic scores and use the middle score (not the average) to determine your credit worthiness. For mortgages no; however, least for credit cards, the Experian score here is sometimes used explicitly as near as I can tell (Amex as one such example). I admit that I am totally baffled by the importance and dependence both the consumer and business puts on credit scores. I have never been turned down for credit in 20 years. Whether mortgage, car, credit cards, or even an unsecured line of credit I've had for nearly 10 years. Only the last few years have I even seen a credit score. I've never cared. As long as I was never turned down for anything, I assumed I had excellent credit. When I refinanced my mortgage a few years ago I was sent a report, along with the paperwork, with my score in the 780s. One of my credit cards just started adding FICO score to your statement and I noticed that mine is now 731. They state the negatives lowering the score as being: % of balances to credit limits is too high on revolving accounts AND proportion of loan balances to loan amounts is too high. First, I know that I can get two more credit cards right now if I want, which would raise my credit limit, thus skewing the balance to credit percentage. As I have 4 cards with zero balance, why would I do that? But it shows the numbers can be artificially manipulated. My loans are a mortgage and an unsecured (because I'm trustworthy) personal line of credit with $9,000 available on it. I don't understand why it matters if you are using all your available credit or if you have 80% unused, so long as you have never missed a payment and can obviously afford the payments. I would close those credit cards I haven't used in years, except it would lower my available credit by $20,000, so I can't. That further proves how artificial the FICO score is in determining who is a good versus a bad credit risk. Can someone tell me how or why we started making the FICO score the be-all, end-all for evaluating of credit worthiness? Because it drives the risk analysis (read: profit analysis) of the lenders who are FICO's customers. It's really that simple, with it lenders can manage their risk and maximize their profits better than without it. As soon as that changes, FICO's going to be out of business. The most important thing to remember is it's not tailored for you as an individual: it's a dataset of literally millions of records which go into the analysis; just because you can pay your debts, have a steady income or whatever, doesn't mean others do. What happens if for example someone with 50k worth of credit card debt that they're simply making the minimum paymens on and living paycheck to paycheck, suddenly loses their job? The banks are out that 50k worth of money potentially, they might see something back in a bankruptcy proceeding if it gets that far. That happened to a lot of people circa 2007-2008. While I understand that one only knows the world as it is presented to you, in this case everyone has to look at the rest of the population to really get a feel for why certain things count the way they do. For an extended period we had a negative savings rate, so if debts are rising faster than income can pay them off (reflected potentially as high utilization on their credit cards) that's a risk from a lending perspective, and it's been borne out in the default data time and time again even on the internal analysis I've seen at a financial institution I was once employed by. That's why it's a negative as far as FICO goes; in reality, unless you're applying for something it really doesn't matter. In your individual case you have a long history with your particular method for handling things, and your lenders know your pattern. Until you do something which breaks out of that pattern, they're not going to care, and for the most part neither should you in my opinion: it just isn't required for the people with pristine credit reports.